Last view: 88 days Me being obsessive compulsive (especially when it comes to hacking ), it would be hard for me to decide if I wanted the water the first way you had it, or the second way, but I guess the second way does look better. I was playing Sonic yesterday (Sonic Mega Collection for PS2), and I noticed that the flowers look similar to the ones you have. Did you get the idea from that? You should see if you can make those flowers animate too. It would look nice. it would be hard for me to decide if I wanted the water the first way you had it, or the second way, but I guess the second way does look better. They don't look like they're supposed to have the same behavior to me. If you could actually swim with the first version, then the second version is definitely better. Clear water vs solid water = same effect. The reason for even doing clear water is so that I can have different colored tiles under it that act like water (like say, colored sea weed) or coins. I think it looks like a Zelda 2 NPC. Then just forget about Peach and pretend it's Daisy. Its using 62 of 64 sprites.. I used the concept by RushJet1 for Boilman. But if i get someone to draw alternate drafts, i might change it. The current one works though. All the other portraits were designed by Vintersphrost. It is possible. Look lady. Last view: 1576 days :o! I like it! Last view: 46 days Not bad Kawa. I was thinking about adding one spritelayer, usually it shouldn´t be a problem, but if the enemies on the screen exceed the colour limit for sprites ( 12 colours are the maximum for sprites), I would recomment Kawa´s version. Here a Peach with 6 colours. I have taken this picture as reference. DD, that peach sprite looks really good. 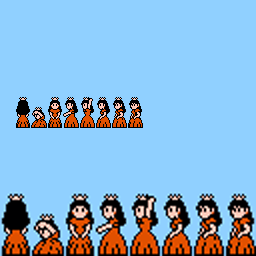 I kinda don't like any peach sprite that's close to SMB2's sprite, but meh, this one looks good anyway. 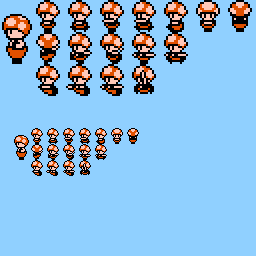 Last view: 1576 days This sprite is actually a derivative of SMB3's Peach Just like Toad! This video shows 2 edited levels of our SMB3 hack, although more has been done since this was made. The map isn't edited yet because we're taking care of the levels first so that we know how many levels will actually be in the first world. Hopefully we'll have some more later! Last view: 3406 days For now we weren't really looking to make a too in-depth hack. Quick has been helping us directly to get started and we're really just interested in level editing using SMB3 Workshop (at least for now). Maybe more will come later, but nothing that can't be done with what we've already been using. What you've been doing to advance SMB3 hacking/with Reuben has been excellent though! Last view: 1576 days well I gotta say I like your level design, I hope you guys keep it up! Last view: 70 days I may not hack SMB3 like I used to since 2006. Here's my Skull Man stage preview for my Mega Man IV project. I will make Skull and Bright Man's Stages before the demo release on Christmas 2009. All I did is transpose the music which is quite easy. Seriously, I need MM1 Music in my hack. Currently on Sprite Checks for all 16 levels to make sure that it isn't buggy by using CSA. MySQL - queries: 119, rows: 159/0, time: 0.134 seconds.